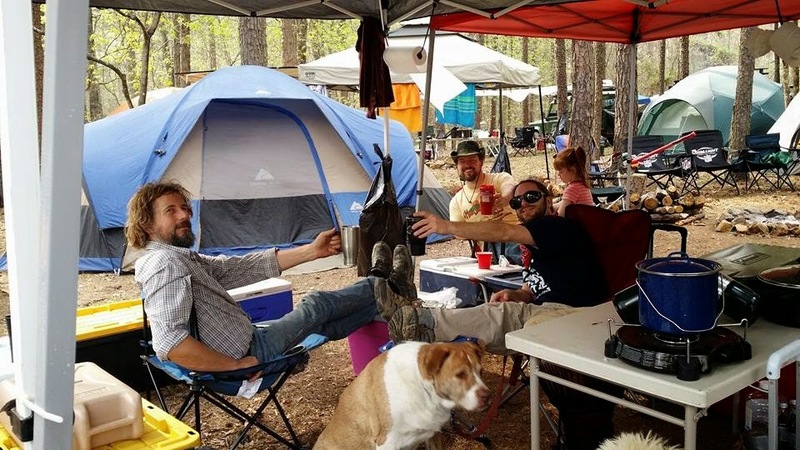 I pulled into the group campground and was instantly welcomed by the event organizers. A wonderful group of Rover enthusiasts and Rover event enthusiasts! Within hours we were on the trails. 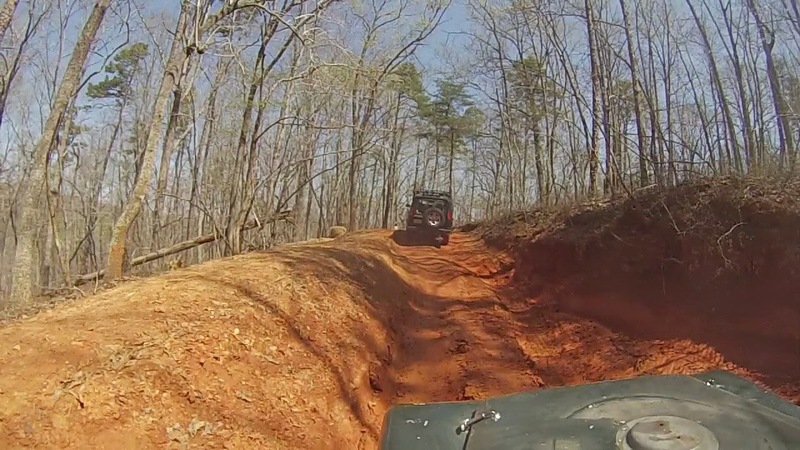 The park has designated off road trails that are well managed and maintained partly by the Carolina Rover Owners Club, the hosts of the Safari. I'm normally quite hesitant to take the truck off road as I've had years of experience busting my trucks and this truck must be preserved. However the organizers described the trails and without deep mud and close trees I was confident to hit the trails. The trails were great and the weather perfect. Back at the camp we spent the evening around the campfire making new friends. 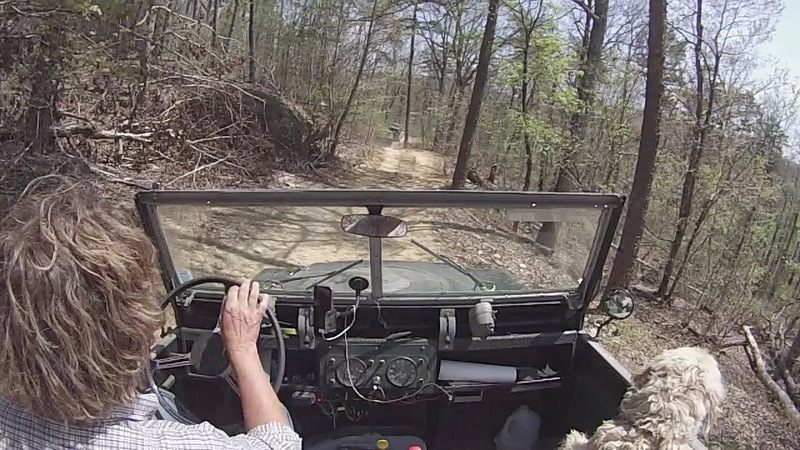 I was treated to a ride in the "Buggy" a rock crawling, hydraulic steered, crazy articulation machine. I had the pleasure earlier of driving it off the trailer. Now we're deep into the extreme trail and powering along. Quite a ride. Friday morning started with a massive community breakfast amongst the event hosts and their families. The demon chef and his cohorts offered up such delicacies as "Egg Mountain"
Then back on the trails. There is vast network of interconnected trails so even as the groups get larger there is lots of opportunity to split up and keep moving. 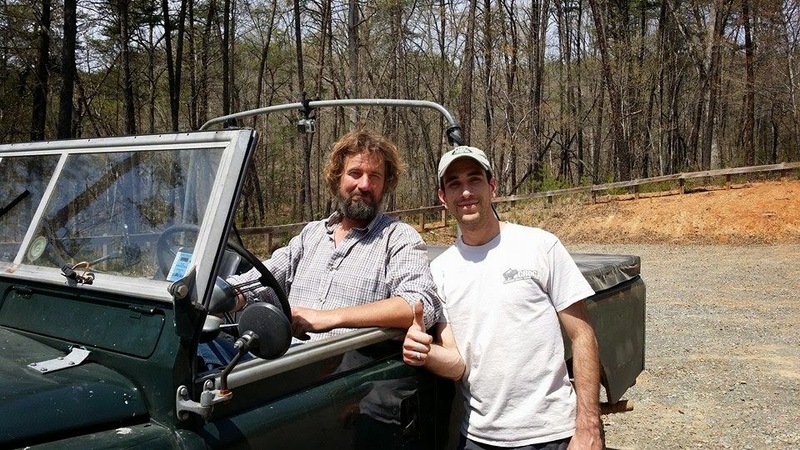 By evening I can say confidently that I have met, here in North Carolina, some of the finest people in the Land Rover community. Their kindness and genuine hospitality was overwhelming. shrimp boil. Fabulous. And the "Chemist", as he began to be known mixed up some splendid offerings along with some other local favorites such as "Apple Pie"! 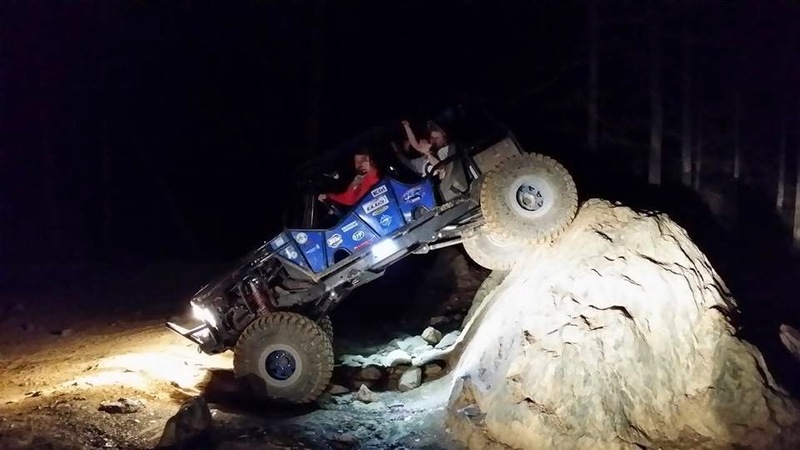 The traditional night run was another fun ride in the buggy, open air motoring at it's best, with some fun rock climbing thrown in for good measure. Trucks were arriving in droves, this is a huge event, I took no tally, but there were well over a hundred trucks, possibly double that, with many hundreds of people. Saturday is also the heavy trail, at first hesitant, my new friends assured me I could easily do it without damage and I have grown to trust them. The trail began with a good steep rocky climb that tested the Rover, but I was pleased to be able to manage it easily. Several more rocky accents made the day just fabulous. Then the big event meal and awards. 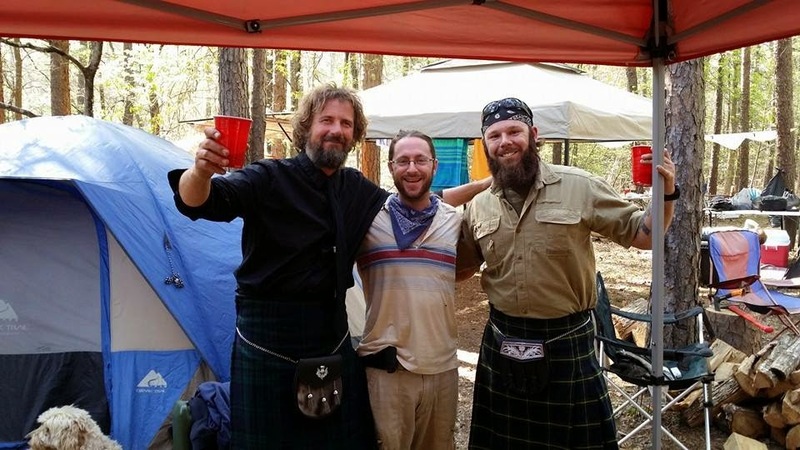 A few of us had kilts so it was certain we must wear them. I think next year the entire crew should be sporting kilts, Eh? Dinner was an amazing BBQ pulled port and the raffle and awards afterwards were lots of fun. I won the oldest vehicle award! Sunday came all too soon, with packing up and goodbyes. 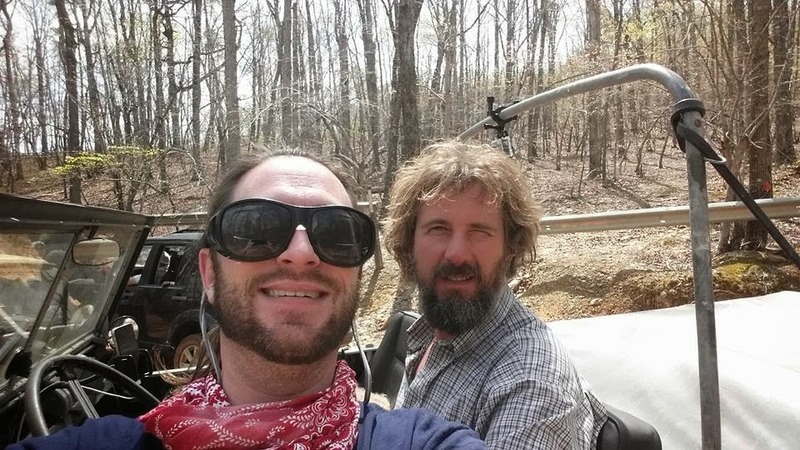 I made some fabulous friends at Uwharrie! Woke up at 5400 feet and after a lovely breakfast I did my walkabout and found a huge blister on the side of one of the coach tires. I don't carry a spare for the coach. Airstream says to just remove the wheel and carry on at reduced speed on one axle. Rather than do that I lowered the pressure and dropped over 300 feet to a little town that amazingly had a new tire. Then climbed back up, a long slow haul. Just north of Ashville North Carolina the Parkway was closed for a 60 mile section. This actually worked out very well for me as I had already planned to travel about three miles east to the Uwharrie National Forest for the Uwharrie Safari Land Rover Event. I arrived a day early, so before joining the Rovers in the big group campground I spent a night at a regular campsite right on the lake. Beautiful! The Blue Ridge Parkway pulls no punches! I love the ocean, but I'm yearning for some hills and valleys. The sea coast, at least in the southern US means dead flat terrain, I haven't stood more than 10 feet above sea level for months. In fact I've been 5 feet below sea level for the last month! So I'm heading inland for the route back north. As a Canadian, I can only be in the US for 6 months in any calendar year so if I want to save two months for this November and December I need to be out of the country before May 10th. So I'll meander north up the Appellation trail. A continuous two lane route over the backbone of the eastern mountains. The trail is documented several places but I'm following a route recorded by Jamie Jensen in his books and website. This road route follows very closely the actual Appellation hiking trail. The southern terminus in Atlanta Georgia, so I'm off! It took me two days to drive the short run up to Atlanta, it simply poured rain at such a rate driving was impossible, I spent lots of time doing office work. On the morning of the third day I woke in Athens Georgia and was finally on the trail. Truthfully, this lower section is mostly highway working up to the foothills on the Great Smokey Mountains. But the drive was wonderful none the less. The terrain became undulated with green hills and deep valleys, white horse fences and endless huge rhododendrons in bloom perfume the entire countryside. As I crossed into North Carolina I began to get a taste of what mountain driving was going to be like with this rig. The V6 in the Rover is stout but steep grades and a heavy coach will really slow me down. Climbing out of Franklin North Carolina I powered uphill in second gear at 20 MPH for 45 minutes! I could have gone quite a bit faster but I'm not going to remember this trip as the death of the Rover. In the lower gears the torque at the transfer case, driveshaft and axle is immense. So I'm only using about 1/4 throttle. I'm in no hurry and there's a passing lane. As I move into the foothills on the Smokies I can see why they're named so, it's as if there are hundreds of forest fires all over the hills, it's completely amazing! Oh my God it's finally done! What a marathon. When I was finally ready to paint I got a two day window of decent weather and pounded the paint on, two coats of two colours. Sadly I was running out of paint on the second coat and couldn't wait to get more so the sheen isn't nearly as nice as it could have been if I could have rolled it on a little thicker. Oh well. I think it looks awesome and the colour is pretty close to the Rover for home brew mixing green and black. But what I'm really ecstatic about is the natural aluminium frames and castings, WOW, love it! Well the rig finally looks a little less ratty. I cant say enough about the wonderful hospitality George here at RDS has shown me. He's become a fine friend. As with every project I start, I have turned this into an epic undertaking. Which really is a shame because I'm only rolling the paint on so the finish will be sort of a pebbly satin. But my thinking is that I want to really get the base done right so if I ever want to repaint with a spray gun there won't be nearly as much prep. I fixed dozens of dings and dents. Patched the big holes left by the old tail light assembly. Patched old water fitting holes, furnace holes and random unknown holes. Stripping and burnishing the window and door frames was a lot more work than I'd hoped but I think the result will be worth it. I have to just stop and get the paint on this poor thing! Travel trailers have three types of water tanks. Fresh water tanks, grey water tanks, and black water tanks. The former holds well, fresh water, the latter only sewage from the toilet and the grey tank takes waste water from the sinks and shower. When this trailer was made in 1973 it had a 30 gallon fresh tank, a 15 gallon black tank and no grey tank at all. In the 70's is was generally acceptable to dump dishwater on the ground. Well the 30 gallon fresh water tank is still in great shape and it's right at the front of the coach under the big panorama windows.. The black tank was in a platform under the toilet an has long since failed and been disposed of. 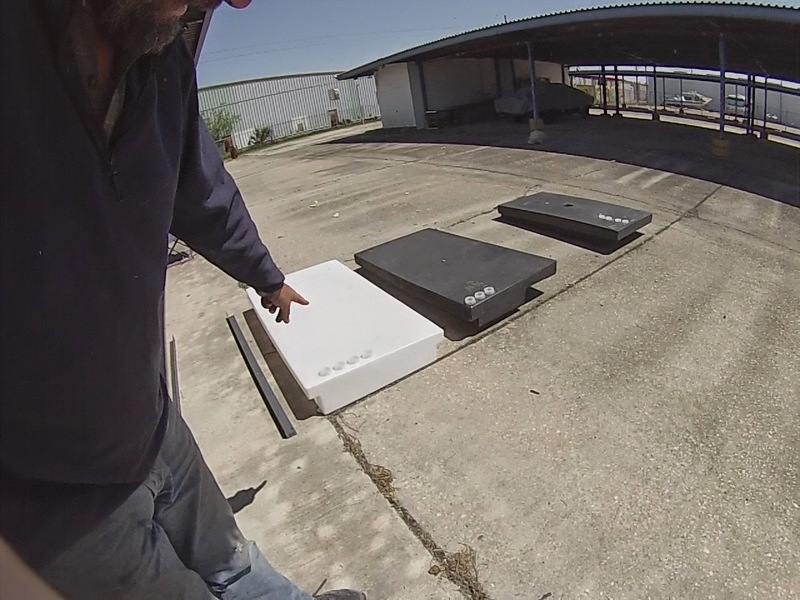 So many months back I looked through hundreds of available RV tanks and eventually settled on 3 large tanks that all fit within the frame rails. each tank is about 50 gallons, and with the existing 30 gallon fresh tank I'll be carrying 80 gallons of fresh water. These tanks are several times larger that those supplied with new Airstreams. 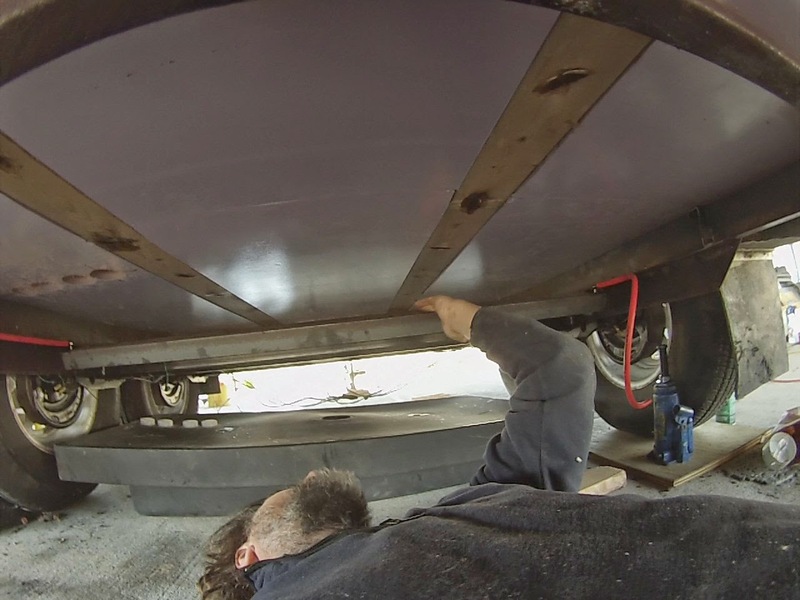 Now there's a reason Airstream doesn't put huge tanks in, they have a belly pan which I've had to largely abandon as my tanks hang below the belly pan, and weight. Iff all these tanks were full it would add about 1500 pounds to the coach. Not ideal. But you would never have all the tanks full, water tends to move from one tank to the others. I won't always use them to capacity, but in cases of prolonged boondocking I like having lots of reserve. The tanks all have 2" wide shoulders on the edges, this makes it very easy to mount them between the frame rails using 2" steel angle. The install went very well with the exception of the manufacturer putting the vent, sensor and washdown fittings on the black tank in the wrong place so instead of coming up in the generator locker they come up under the toilet. No problem I'll just get a low toilet and build a plinth to house the plumbing. Crawfish boil, snagged from the web. It's Sunday afternoon, and I hear "C'mon over for some mudbugs!" It turns out my neighbours are a community of film industry set artists. 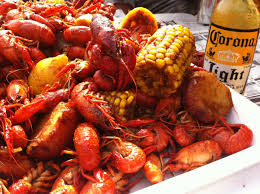 and Sundays they host a massive feast of some sort, this Sunday is a crawfish boil. Mudbugs! I split crawfish and drank beer with this amazing pocket of creative people until late. A true Louisiana experience and I'm privileged to have been invited. No pictures, it all happened so fast.